With the recent release of our Dismounted Cavalry packs, PaperTerrain has completed its first series of American Civil War Paper Soldiers. 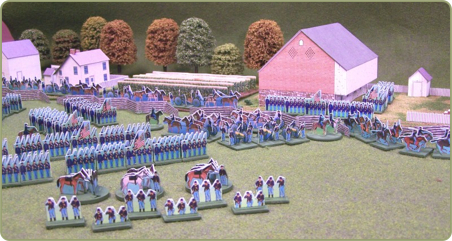 You can now build nearly any army that saw action during the Civil War. To help people get started with their armies we are now offering Army Packs which come with one Infantry Set, one Artillery Set, one Mounted Cavalry Set, and one Dismounted Cavalry Set. In 15mm Scale this comes to 1,100 infantry, 27 cannons with crews and limbers, 192 mounted cavalry and 583 dismounted cavalry, horseholders and horses, all for $50.00. Buying the sets separately would cost $65.00. In 25mm Scale this comes to 730 infantry, 21 cannons with crews and limbers, 120 mounted cavalry and 386 dismounted cavalry, horseholders and horses, all for $65.00. Buying the sets separately would cost $80.00. An Army Pack will give you everything you need for a substantial army. Just add more infantry packs to get an even bigger army.